2. _____ sure takes some getting used to! 4. _____ is my favorite nick name for _____. 5. It took a long time, but _____. 6. _____ though I wouldn't have it any other way. My post will be up at midnight. Mine will be posted HERE around midnight EST! Okay after four tries I think that I have the whole clickable link thing down. I'm in, relatively early for a change. My fill ins are up..
Great to see more people doing it! I usually go through others on Saturday! I decided to play along this Friday over here! 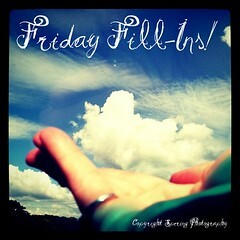 :] Happy Friday! I am too late for this but too early for the next so I did this since I missed last week's FF. I missed last week! :( I am back this week though! You can see my answers on my blog.